This Greeting Card comes in birthday and love theme variants. 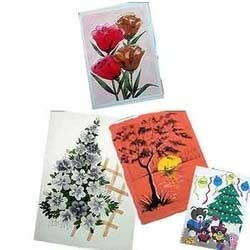 We are passionately engaged in manufacturing an exclusive array of Birthday Greeting Cards. These are handmade cards made of handmade high quality papers.We craft these cards in different ways like stamping, quilling, with imported flowers, with handmade paper flowers etc.it can be personalised for any occasion liki birthdays, Diwali, pongal, Anniversary, best wishes etc.They are priced at Rs.50 each with cover.